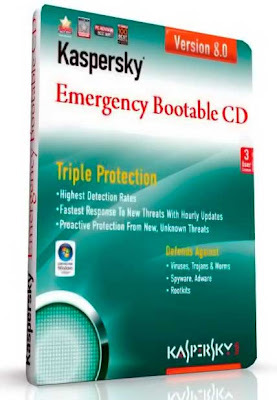 Kaspersky Rescue Disk 11 is a bootable CD containing a set of tools for efficiently detecting and eliminating computer infections. It is required when a computer is so damaged that the operating system or antivirus software fails to launch correctly. The ISO image includes up-to-date antivirus databases and configuration files. This Kaspersky Rescue Boot Disk was created with Kaspersky Internet Security, version 11.0.1.400 (x86), on a fully updated Windows XP3 machine. The application should be used when the infection is at such level that it is impossible to disinfect the computer using anti-virus applications or malware removal utilities (such as Kaspersky Virus Removal Tool) running under the operating system. In this case, disinfection is more efficient because malware programs do not gain control when the operating system is being loaded. In system rescue mode only object scans and database updates are available as well as update rollback and viewing of statistics. - Autorun objects can be disinfected. - A heuristic analyzer has been added. - The program modules have been updated. - RAID arrays support has been added. - The ability to configure a network, including Wi-Fi, has been added. - Text mode operation has been modified. - The operating system loader has been modified. - The operating system kernel has been modified. - The third-party application packages have been updated. - A set of third-party application packages has been added.